Erik and Diane Roberts’ 21-month-old son Ryan was born with a heart defect and Down’s syndrome; he has undergone surgeries since he was four days old. Ryan’s parents were recently told that there is nothing more doctors can do for him, and Ryan isn’t expected to live much longer. A parent’s worst nightmare. The Roberts try to make the most of their time with Ryan–creating special moments and memories with Ryan. They had him pet a puppy, ride a bike (with help from dad) and Ryan even shared his first beer with his dad for his 21-month-old birthday (root beer). When people found out about Ryan they started reaching out to his family and asked what they could do. In an interview with MSNBC his mom said that his hospital room “looks like a . . . toy store.” She asked for no more gifts or cards. In early June one of Diane’s friends setup Ryan’s Banana Split Party on Facebook, inviting 200 of her friends to have banana splits as dinner and post the pictures. That was just the beginning. As of today, over 65,000 people have signed up to have banana split parties in honor of Ryan. Sometimes we might get stuck in a routine. Why not do something crazy and memorable a little more often? Maybe some of those crazy things could even become yearly traditions? 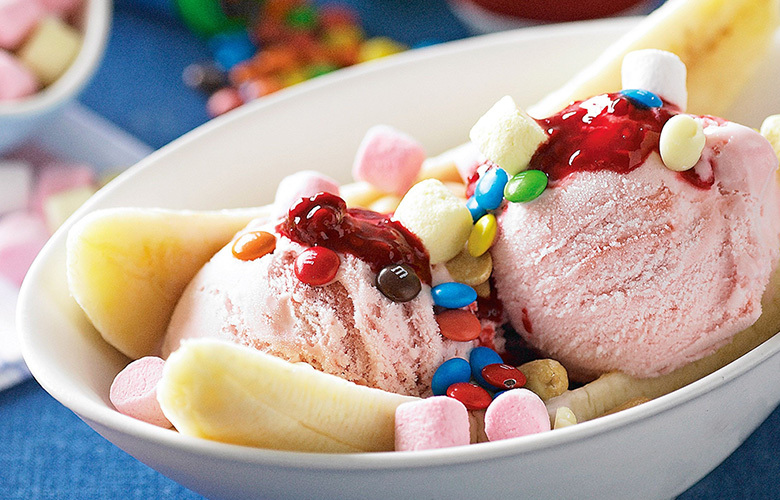 Banana split party replaces dinner every June 21? A crazy yearly holiday you invent just for your family? This story is a good reminder to live life to the fullest, have fun every day and create special memories with the special people in our lives. Let’s not take anything for granted. If you enjoyed this article, you’ll also like: An Ordinary Person Doing Extraordinary Things–How a 29-Year-Old Stockbroker Saved 669 Lives on Nights and Weekends.